Nine years ago this month, DH & I were saying goodbye to friends and family in Milwaukee in anticipation of moving to AZ after the holidays. When people asked about missing snow for Christmas, DH always replied that we could travel to Flagstaff whenever we wanted and see snow. On Monday, we traveled to Flagstaff for the first time. The boys have been asking to see snow for ages, and with a winter storm blowing through, we decided to take off for Flagstaff (about 3 hours from our home) and take some pictures in the snow and let the kids finally make snowballs. It was definitely snowing and we stopped at a park about 20 miles outside of Flagstaff to let the kids run and play in the snow. We got some great pictures and the boys had a blast. The snow was coming down softly and C kept complaining that we did not stop and buy them mittens because it was cold. 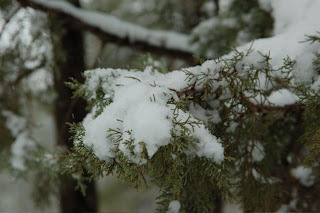 N mentioned that he never thought snow would CRUNCH, he thought it was just soft like cotton. I thought that was a pretty interesting observation -- growing up in snow I never thought about the crunchiness of it. After a while of making and throwing snowballs, and running through the snow, we decided to climb back in the van. We drove a bit further into the park, thinking there would be more to see, and assuming there would be another parking area not that far. We were wrong. I was thankful that we had cell reception, and called AAA. Who took all my information, assured me someone would be there in an hour, and told me to keep the baby warm. And then called back to tell me they couldn't help me after all, since I was in a state park and off a paved road (the snow was covering it and we didn't realize it wasn't paved.) They connected me to a towing company who wanted almost $500 to come and try to pull us out. I took his number and we began brainstorming. We called the sheriff's office, who promised to come check on us in a few hours -- definitely before dark he thought. We called information trying to get a number for a park ranger, with no luck. 2 young men drove by on their ATV's and tried to help push us out. They had no luck either, so they offered to go get their truck and come back with a chain. After they left, another ATV came by and he worked for the fire department, so he offered to get one of the trucks from the station. The 2 men came back with their truck and after much effort, our van was back on the road! We thanked them profusely (thanks again, Cody & Cameron!!!) and they offered to follow us out in case we went off the road again. I got everyone strapped back into the van and we were about to head off when DH looked out the mirror and said "Um, I think they're stuck!" Sure enough -- their truck went off the road and so DH tried to help them get back on the road. A truck drove up and I went to the window (I was blocking the road at this point, but I was afraid to move the van), and I told him that we were stuck, but 2 kind boys helped us, but now they were stuck! He asked if it was a black truck and I responded that it was. He shook his head a little and said "That's my son . . . " About that time, DH & the boys came around the curve and DH said the boy said "Oh, this is embarrassing, that's my dad!" Turns out, his dad was the fire chief. The chief got his truck around our van, and I assume he pulled his boy's truck out of the ditch. We carefully drove out of the park, hopped back on the freeway, and drove back to warm Phoenix. N said at one point "I need to really enjoy this, because this is the last time I'll be a child in the snow! ", because I kept saying this was the last time I would make this trip! LOL! It was actually a fun day, and I'm glad I went. I'm also perfectly happy waiting another 9 years to spend time in the snow! And that's with a baby nursing in my lap!